Tag Archives for " Pre-pay option "
I’m considering a big road trip in June and thinking about renting an SUV instead of putting mileage on our existing cars. Normally I used Breezenet.com as my prefered sites for booking my cars. I found some great rates in the past. Years ago, I remember one car rental person in Gatwick asking where I had booked it as he had never seen such a low rate. I didn’t see such screaming low rates today so out of curiosity, I decided to look at Avis’ site where I have a Wizard number and sometimes good rates with that. Even without a Wizard number, they show better rates than Breezenet rate if you pay in advance. Same car is $110 cheaper. As a test, I plugged in my Wizard number and it made no difference. The small print on the cancelation is $25 if 6 hours before and within 6 hours is a $100 NO SHOW fee. There is always the priceline name your price route but personally, I like the transparency before I jump into something. I also have a good experience of AVIS where I use them a lot for business travel. 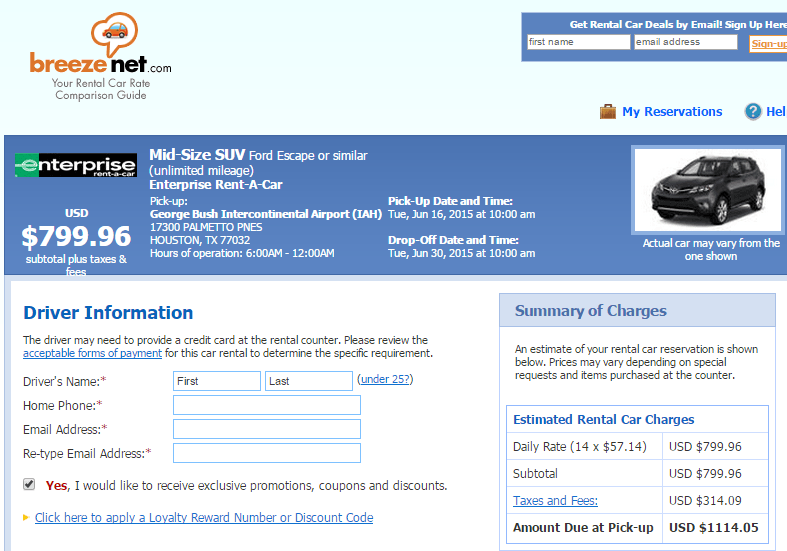 For the record, here is Priceline’s comparison (Breezenet is owned by Priceline. Unbfortunately as I seem to remember getting better rates before aquisition). Note that National are owned by Enterprize hence the Priceline/National rate is the same as Breezenet/Enterprize rate. Confusing, I agree but welcome to the world of travel brands where so many sites and companies are in fact the same company. I looked at the Budget’s pre-pay option for same type of car. Slightly higher but here again, slightly better car. Edge vs Escape where I didn’t see the Escape as an option. By the way, the $1084 rate in Priceline is for the Escape and the $1329 is for Edge. Whatever way I book, seems like pre-pay directly form the car rental companies is best saving with ~30% each time. This is also what Priceline ‘name your price’ claims to offer. 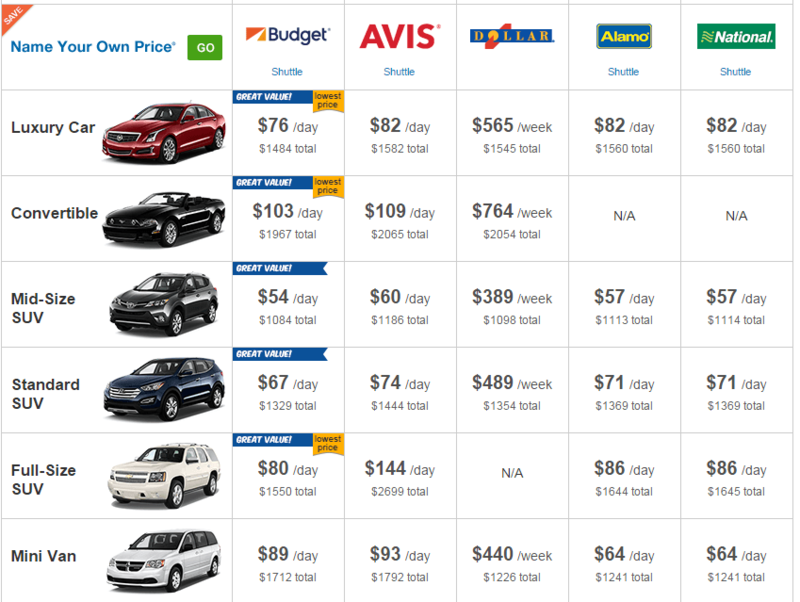 If so, their pricing edge (SUV pun intended), may be changing for car rentals.